Advanced Word Processing, Microsoft Word Lesson Plans for High School | TechnoAdvertise | TechnoKids Inc.
Promote competence in a real world simulation. Master technology and life skills. Build advanced word processing skills using Microsoft Word. Compose a resume to get hired. Design publications for an Ad Agency. * Item price is per site and a one-time fee. 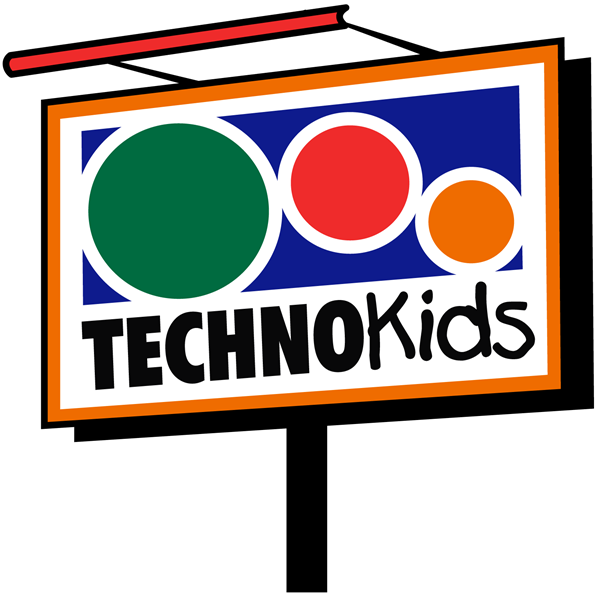 When you order TechnoKids Computer Curriculum you are granted a perpetual site license. The site license allows you to teach your students using the purchased instructional materials at a single, designated location such as an elementary school, high school, training center, learning center, college, university, or home school. You are not permitted to use the Curriculum at multiple locations. 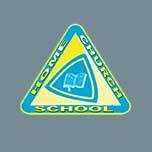 The site license permits you to print or view an unlimited number of teacher guides and workbooks at your location. It also allows you to place the resource files on an unlimited number of devices at your location. The Curriculum can be shared with students using a memory device, local computer, LAN server, or secure cloud-based server. Posting files in the public domain on the Internet is prohibited. For more information read the site license agreement. ADVANCED WORD PROCESSING FOR HIGH SCHOOL: Engage student interest as they play the role of an advertising agent. 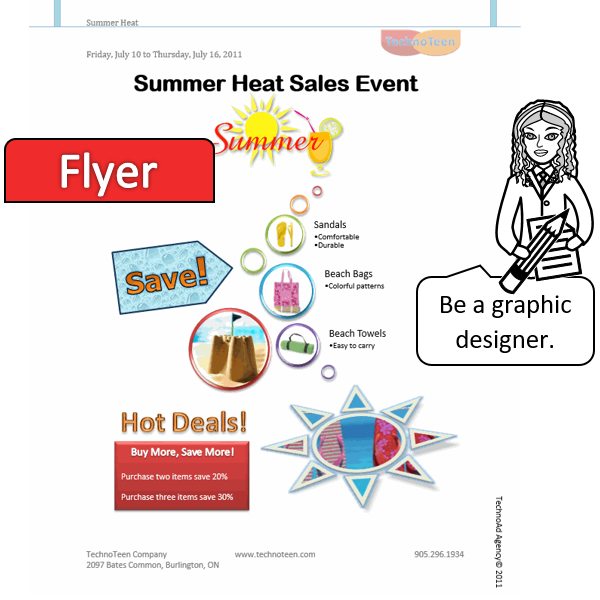 Design an advertising flyer, a product catalog, and a newsletter. BUILD STEM AND CTE COMPETENCE: Make learning meaningful using authentic, real-world tasks. Following guided, step-by-step instructions, students write a resume and cover letter. Develop vital technology proficiencies for future careers. CHALLENGING SKILLS: Learn everything there is to know about Microsoft Word – create tables, set styles, format graphics and smartart, organize a document into sections, make a table of contents, generate an index, mail merge, and more. COMPLETE RESOURCE KIT INCLUDED: For the teacher – PDF Teacher Guide, marking sheet, and skill summary. For the student – PDF Student Workbook, sample cover letters, resumes, flyers, catalogs, newsletters, templates, and checklists. FREE SUPPORT: Questions or comments about our curriculum? Email or phone and speak to a real person! View job posting. Plan content of cover letter and résumé. Explore the program window and ribbon. Highlight your talents and accomplishments. Summarize education, work experience, and relevant skills. Submit the cover letter and résumé by mail or digitally. Explore commands to insert pages, graphics, links, and more. Begin to design a publication using text, images, and shapes. Enhance the ad using SmartArt, headers, and symbols. Discover commands to format pages in a document. 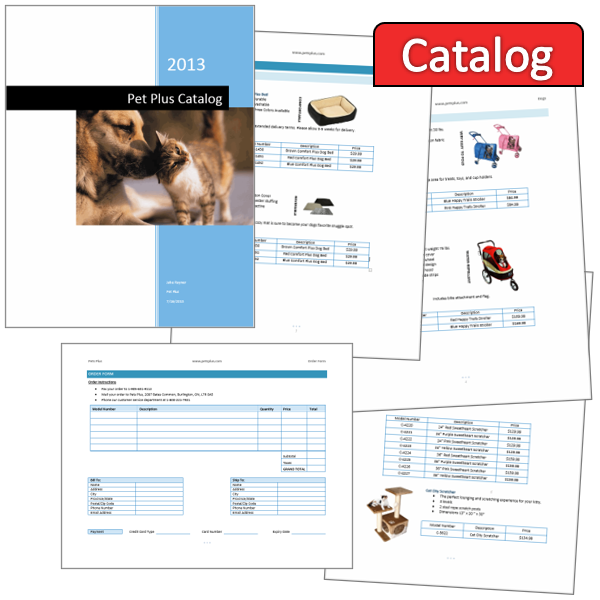 View catalogs. Determine products to include in publication. Divide a document into sections and add content. Build a form using tables that includes order information. Practice adding references to a sample document. Add table of contents, cross-reference, and index. 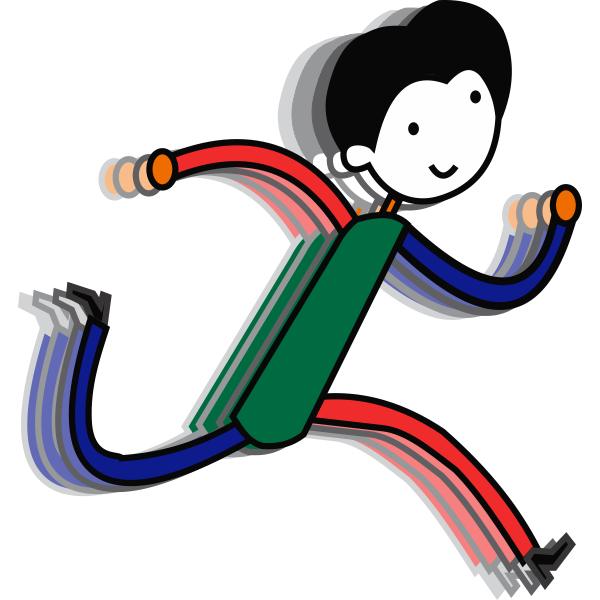 Personalize a form letter using mail merge. Address envelopes using mail merge. Plan content of a newsletter for an organization. Apply formatting techniques to design a publication. Improve the content, design, and layout of the publication. The Interview: Take part in a mock interview. Job Acceptance Letter: Use letter writing format. Design an Event Poster: Advertise a dance. 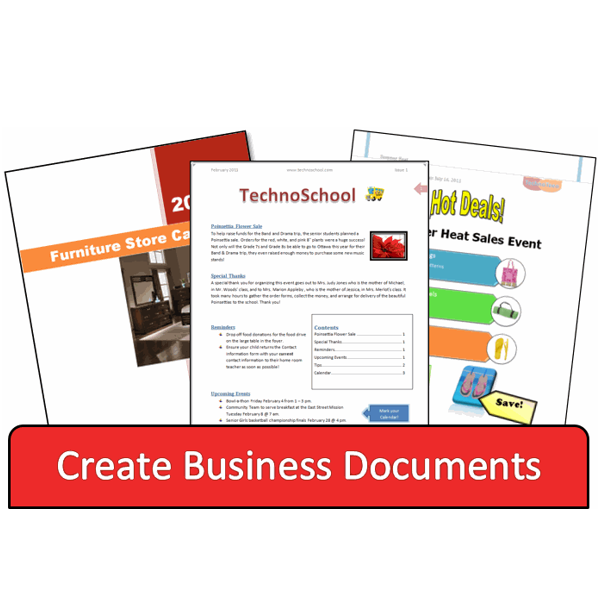 Create a Fax Cover Sheet: Layout a cover sheet. Cite the Source: Use Word to organize references. We are Moving: Merge data to write a form letter. Use TechnoAdvertise with unlimited users at your site. A site is a physical location such as classroom, school, learning center, daycare, library, or home. If you teach at multiple sites, you will need to purchase one set for each location. Individual projects are downloadable. Order 5 or more projects or a set and receive a USB drive. Transfer the files to all devices at your site. 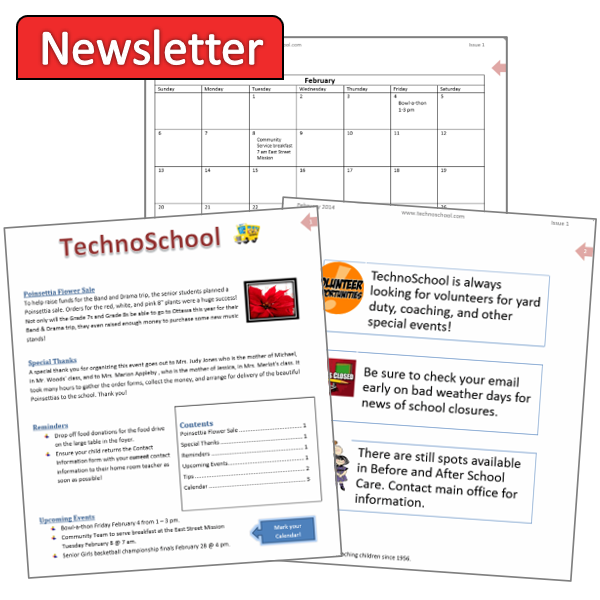 View the PDF teacher guides and workbooks digitally or print as many as you need. Files CANNOT be posted in public domain. Include TechnoAdvertise in a computer application, career training, workplace preparation, or business studies course. Build practical workplace skills and make real world connections with Microsoft Word projects for high school students. Teach advanced word processing skills with TechnoAdvertise Microsoft Word lesson plans for high school. Students create a cover letter and resume to apply to the TechnoAd Agency. Once hired they design a flyer, catalog, custom mailer, and newsletter for clients. Master skills in creating tables, styles, mail merge, table of contents, index, and more! Excellent, engaging worksheets that students love and teachers love more! Project-based learning with lessons that are well conceived and have a logical flow. Maybe tone of worksheets is more appropriate for middle school students - older students may find language a little young. Support team is reliable and friendly. I love how easy it is to navigate the materials. 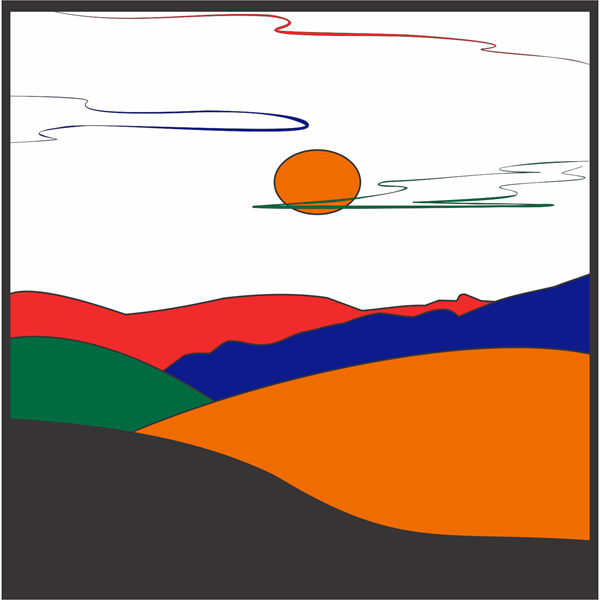 The teacher guides and student workbooks are laid out in a way that even the most novice computer teacher or student can follow along and create the projects. I also love all the optional activities added along the way for students that are more advanced or those who want to give themselves a challenge. Thank you for checking in and following up on my use of Techno-Kids. I love it! I have been using the curriculum for my gifted education students to introduce them to Access, Excel, Publisher, as well as further their knowledge and skill with Word and PowerPoint. I am currently using three different projects geared to my elementary (Quest), middle (Entrepreneur), and high school students (Advertise). Don't need support right now, but I am glad to know that it is there if needed. The curriculum is great! Everything is readily available. Thank you for such a wonderful product. I love the curriculum that TechnoKids provides to teachers. Every chance I get I tell other computer teachers of your work. The projects through TechnoKids are legendary in my school and students come in asking about them on the first day of class (and I teach high school). I noticed that when I am using TechnoKids curriculum, I have less attendance, discipline, and attention problems with my students. Thank you for such a wonderful product at a price teachers can afford. Activities emphasize real-world applications of technology. Prepare students for higher learning and career readiness. Create a digital scrapbook. Retouch, crop, adjust, warp, recolor, and superimpose images with Photoshop lessons for beginners. 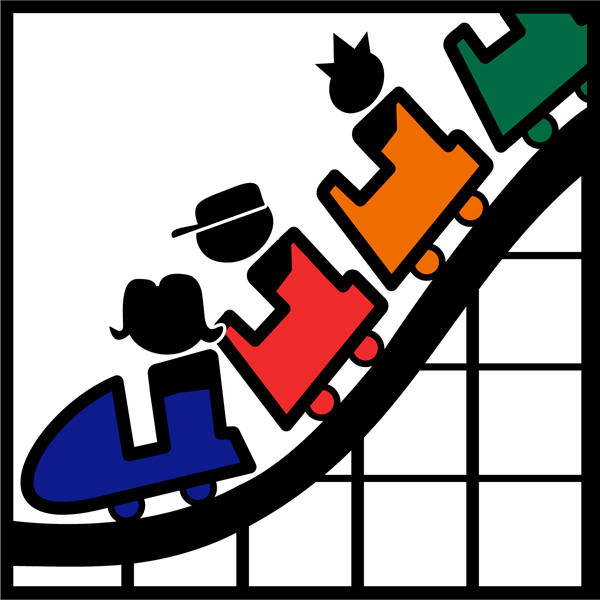 Promote an amusement park. Solve a variety of challenges with Microsoft Office lessons. Create an animated space story with Adobe Animate CC lessons. Animation for beginners.